People demonstrate across the street from the Ferguson Police Department. Whites in the United States approve of police officers hitting people in far greater numbers than blacks and Hispanics do, at a time when the country is struggling to deal with police use of deadly force against men of color, according to a major American trend survey. Seven of 10 whites polled, or 70 percent, said they can imagine a situation in which they would approve of a police officer striking an adult male citizen, according to the 2014 General Social Survey, a long-running measurement of trends in American opinions. When asked the same question — Are there any situations you can imagine in which you would approve of a policeman striking an adult male citizen? — 42 percent of blacks and 38 percent of Hispanics said they could. These results come as Americans grapple with trust between law enforcement and minority communities after a series of incidents, including the deaths Michael Brown in Ferguson, Missouri, and Eric Garner on Staten Island, New York, both black men. Thousands of people protested in the streets last year after the deaths of 18-year-old Brown and 43-year-old Garner, who gasped “I can’t breathe” as police arrested him for allegedly selling loose, untaxed cigarettes. But the survey shows the gap between whites, blacks and Hispanics long predates the recent incidents. However, blacks and Hispanics “are more cautious on this issue because of their personal experiences and/or the historical treatment their groups have experienced at the hands of the police, which is only recapitulated in recent disputed killings,” he said. The General Social Survey is conducted by the independent research organization NORC at the University of Chicago. Because of its long-running and comprehensive set of questions about the public, it is a highly regarded source of data about social trends. Numbers from the 2014 survey came out last month, and an analysis of its findings on attitudes toward police and the criminal justice system was conducted by The Associated Press-NORC Center for Public Affairs Research and the General Social Survey. — A larger number of blacks could approve police striking a murder suspect who is being questioned: 24 percent, compared to 18 percent of Hispanics and 12 percent of whites. — At more than half of whites, 69 percent, and half of Hispanics approve of police hitting suspects trying to escape from custody but only 42 percent of blacks approve. — Two-thirds, or 66 percent, of whites say they favor the death penalty for convicted murderers, while 44 percent of blacks and 48 percent of Hispanics agree. — Almost everyone seemed to approve of police officers hitting suspects back when attacked with fists, but whites again outpaced blacks and Hispanics with their approval. Nine in 10 whites approved of police hitting a person when attacked by fists, with 74 percent of blacks and Hispanics agreeing. Charles R. Epp, a University of Kansas professor and author of the book about race and police stops, said the majority of whites believe they are going to get “reasonable and fair” treatment from officers, and that encounters ending in violence are caused by the suspect. There were areas of agreement: Similar small percentages of whites, blacks and Hispanics approved of police hitting suspects for using vulgar or obscene language toward an officer (9 percent for whites, 7 percent for blacks and 10 percent for Hispanics). Similar percentages agreed there is too little spending on law enforcement (47 percent of whites; 49 percent of blacks; 40 percent of Hispanics). Associated Press News Survey Specialist Emily Swanson contributed to this report. 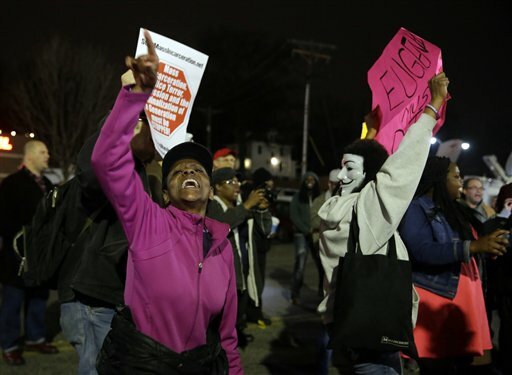 Jesse J. Holland covers race and ethnicity for The Associated Press. Follow him on Twitter at http://www.twitter.com/jessejholland or contact him at jholland@ap.org. Until they believe it will happen to them. You beat me to this (no pun intended). Those who favor discrimination never imagine they will be discriminated against.